"One lucky educator will be able to do just that, and win a class room prize pack from the show as well. 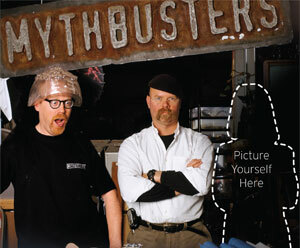 If you’d like it to be you, all you have to do is enter the “Bust-A-Myth” Video Challenge. "We’ve chosen three popular myths from the show. Is a piece of buttered toast more likely to land buttered side up or buttered side down? Is it possible to fold a piece of paper more than seven times? Will cola clean a penny? Discolor a tooth? Dissolve a steak?" "Once they’ve chosen the myth, they have to learn about the scientific process and how the MYTHBUSTERS tackled the same myths through resources from Discovery Education. From there, they just have to develop a project plan, do the investigation, and create a video to document their results (5 minutes or less)." "Our team of judges will evaluate the videos based on Creativity, the Investigative Process, and Student Engagement. The top five videos will be posted up on our Facebook page for the Discovery community to vote on." A trip for two people to San Francisco to attend a live taping of a MYTHBUSTERS episode"
In order to get the word out about the competition, I submitted morning announcements, spoke at lunches, and held an information meeting in my classroom after school. I had so many students that wanted to get involved, that I had to create an application in order to select the best candidates. After all, this was a national competition. We began working immediately as soon as we had our team. The competition only allowed a month for the video to be created and submitted on the DEN's Facebook Page, and one of those weeks was our Spring Break. After a lot of deliberation, the students selected the myth, " Will cola clean a penny? Discolor a tooth? Dissolve a steak?" As the facilitator of the team, I made sure that the entire challenge was student-centered and student-directed. My role, was to digitally record the students going through the Scientific Method, as they worked through the challenge of testing the myths. So, will cola clean a penny? Discolor a tooth? Dissolve a steak?